Heavenly is our home resort, about 15-mins from our house in South Lake Tahoe. We’ve been skiing Heavenly about every-other weekend during the ski season since 2005, so we have a lot to say about this place. It’s one of our top 5 favorites of all the places we have skied in North America, so that is saying a lot. The bottom line is that some of our best skiing experiences have been there, and we almost always have a great time even when we think we aren’t going to because of the conditions. We usually park at the California lot and like to get there by 8:15 on a weekend so we can get first chair at 8:30. The lower California runs are very steep, bumpy, and at low elevation which makes it pretty grim at times, but lately they have been blowing snow on Gunbarrel which makes for a surprisingly good last drop to the parking lot later in the day. When the East Bowl is groomed or there is more than a foot of new powder it’s a great run. The trees to skier’s left of East Bowl are some of my favorites on a powder day when there is an adequate base. The next chair up is Powderbowl. On a windy day storm day when the upper mountain is closed this is your only option. Powderbowl trees are fantastic before they get plundered. The trees above and to skiers right of Waterfall are a “secret stash” of ours for untracked powder. The power line to skier’s left of Waterfall is steep fun. Upper California has some great groomers on a non-powder day — especially if Ellies or Liz’s is groomed. 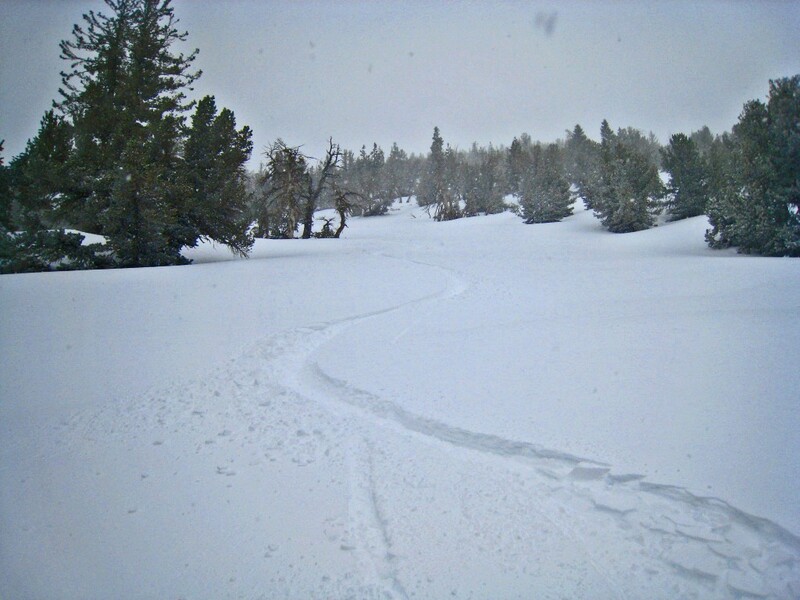 On a powder day there is a huge area to skier’s right of Ellies and Pinnacles that stays relatively untracked due to the difficulty getting there. On a powder day when Sky is closed but Canyon is open, it is possible to traverse all the way over to Ellies and ski untracked powder on the wide open run. Before Sky gets too crowded, we often head over to Nevada. What we ski depends largely on conditions. On a powder day we most likely won’t even touch the groomed runs. Our usual first run in Nevada is through the trees in Milky Way bowl. Then we work our way over to the runs off the Dipper chair, then Comet. Skiers left and right of the Dipper run off the Comet chair are good tree runs. Dipper itself is a bumpy challenge if you feel like punishing yourself. Next we head over to the Olympic chair. 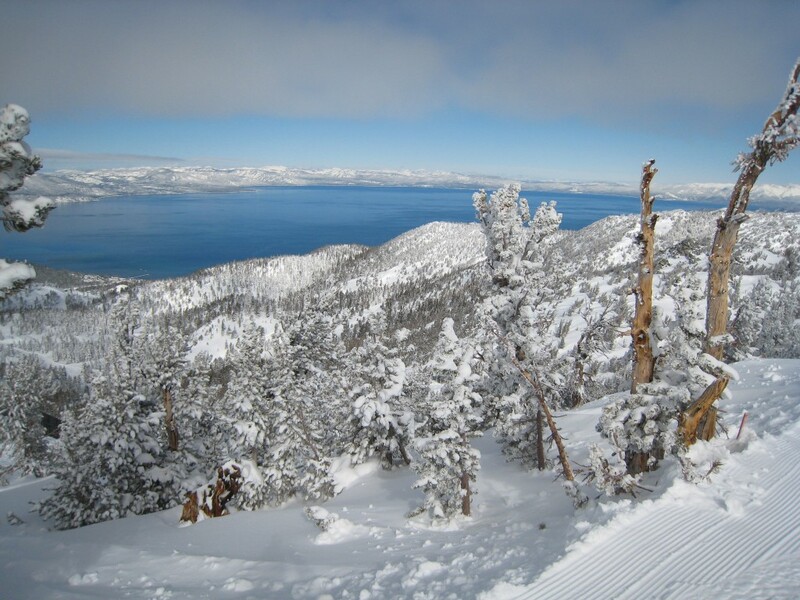 Don’t miss the “top to bottom” run on the Nevada side, which is from the top of Olympic all the way down what they like to call “Olympic Downhill” (although it would never qualify as an actual Olympic downhill course!) to the bottom of Stagecoach. It’s a leg-burner. On a powder day “North Bowl Trees” to skiers left of the Olympic and North Bowl lifts are worth a couple of lung-burning long powder runs. Stagecoach has some great groomed runs skiers right of the chair with great views of the Carson Valley below. Special mention should be made here of one of the unique features of Heavenly. From the top of Olympic it is possible to ski all the way down to the bottom of the Gondola by using the Firebreak gate. It’s technically out-of-bounds and is definitely not patrolled, so ski at your own risk, take a friend, blah, blah. 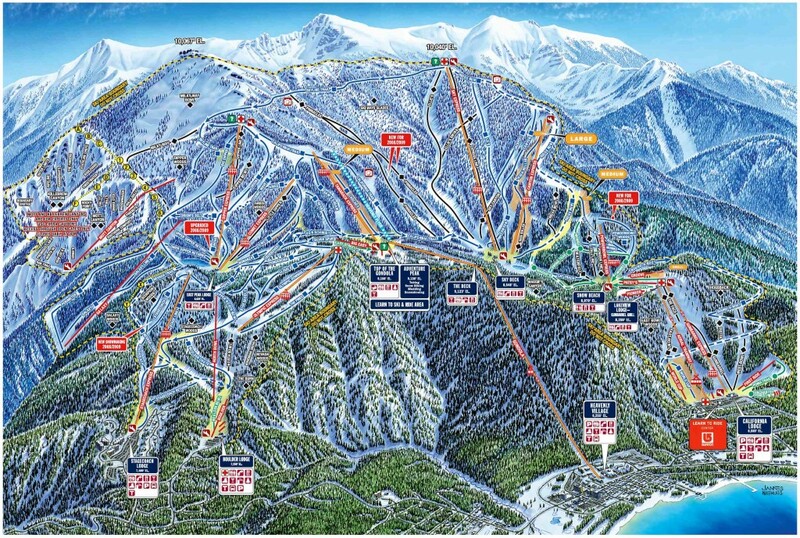 Realistically it’s full of people on a powder day and you would have a tough time getting lost if you tried. Note that the bottom third can be really difficult to navigate sometimes, but when it’s on after a big snowfall you can find all the powder you want on the upper 2/3’s, which is somewhere around 2000 vertical feet of perfectly pitched open tree skiing. We are tree skiers, and Heavenly has the best tree skiing on the planet as far as we are concerned. The trees are widely spaced and there are plenty of less steep areas with great tree skiing after a storm. The grooming is also 2nd to none, so after the powder firms up off-piste, a great day can still be had on the groomers. Most of the lifts have been converted to high-speed quads over the years. The views of Lake Tahoe and the desert to the east are spectacular. There are 3 gates that provide easy access to some great sidecountry, with the firebreak gate providing 3000′ vertical of “lift served sidecountry” (if there is such a thing) via the gondola. The attitude is more positive and laid back at Heavenly than places like Squaw. Heavenly gets a little less snow being on the east side of the lake than places like Kirkwood, Sierra at Tahoe, and Squaw do being on the west side. The lines on the Sky and Dipper chairs are often long. Wind often closes the upper mountain before and during a storm, which makes it impossible to ski between the California and Nevada sides. They need to put a lodge on the California side where the Sky Deck is now because sitting outside at 8600′ in January is not usually comfortable. 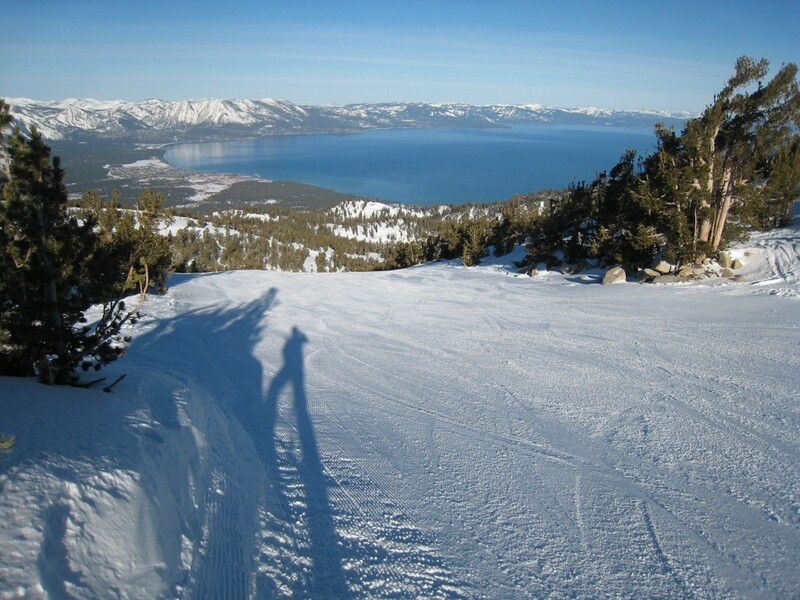 The “Top to Bottom” run (see above), Killebrew Canyon up to 3 days after a storm, the steep chutes in Mott Canyon, groomers on the California side, views of Lake Tahoe, lunch at the Lakeview Lodge. 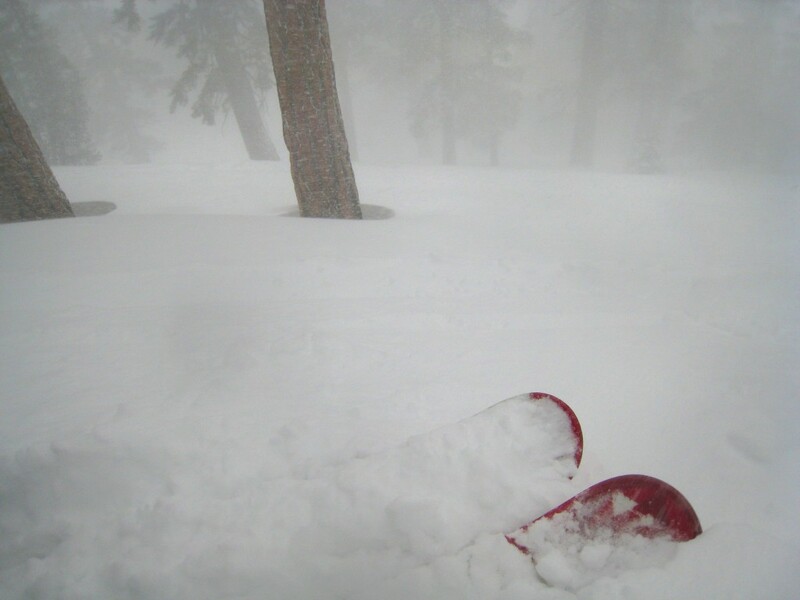 So many to choose from, but the best has to be the day after Christmas, 2012 with 12″ of fresh powder on top of several feet of fresh powder which fell the previous week. Ellie’s run had one track down it when we first skied it that day. I’ve never seen AiRung enjoy a powder run as much as that one! Heavenly may not be at the top of everyone’s list due to typical variable conditions, crowds at some of the strategic lifts, parking issues, and Vail ownership ($$$). But for us having seen all the good and bad it has to offer, it is in the top 5 of our favorite places to ski. Being only 15 minutes from our house means we will continue to spend a lot of time there! Through what gate can you access Hully Gully? Is it very steep? Hully Gully is the easiest run down Mott Canyon, but I can’t actually remember which gate I go through to ski it. On the map it looks like #3 is the closest. I only ski that run when I’m taking someone who has never skied Mott before down or it’s right when the gate drops on a big powder day because the lower angle is actually better for enjoying the powder turns. It’s doable for a strong intermediate who can handle mixed snow conditions, trees, and off-camber. I usually ski Bill’s most often because it’s a perfect north-facing chute steep enough to not form big moguls.